Other photos: Overhead, Bow, Port Bow, Port Profile, Transom 1, Transom 2, Overhead, Triple 627HP Seven Marine Engines, 290hrs and Extended Warranty, Cockpit, Hull Side Door Closed, Swing-In Door Open, Cockpit Looking Forward, Aft Facing Seat with Cooler Underneath, Helm Seating, Helm 1, Helm 2, Photo 18, Bow, Console Forward Seating, Electrically Opens for Head Access, Head, Bow, Bow Storage, Electric Back Rests, Bow Facing Aft, Windlass, Battery Compartment Forward, Custom Anchor Light Mast, Dry Stored. "WILDHARE"has a ride unlike any center console I've ever been on and must be experienced to be appreciated. 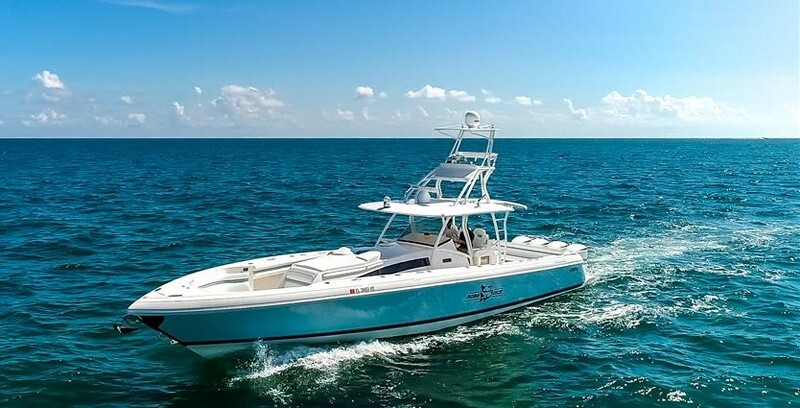 She's been custom designed with performance in mind: the 100 gallon additional fuel tank and battery bank were moved into the bow to evenly distribute weight and reduce bow rise. The seller's goal in building this 400CC was not to maximize speed at WOT, but to achieve the fastest possible cruise speed: over 50mph at 4,000RPM burning 80GPH total. However, the seller has also reported a top speed of over 80mph, making her the fastest Intrepid ever built. Triple 627HP Seven Marine Engines have 290hrs and warranty until 4/15/2021. She is dry-stored indoors with no bottom paint. With a new Intrepid on the way, the seller is ready to make a deal --- offers strongly encouraged.